You look in the mirror and see a new wrinkle. Your jawline has lost the tautness it used to have. What’s happening? Year by year, the amount of collagen in your skin is declining. As it declines, the firmness of the skin softens and the skin starts sagging into folds, wrinkles, jowls and bags. A number of things can make this process happen faster — excessive tanning, smoking, severe illness — but it feels like nothing slows it down. I’m a huge fan of doing regular skin-tightening treatments — treatments that build up the collagen in your skin — in order to prevent progression and reverse the wrinkles and sagging that you already have. 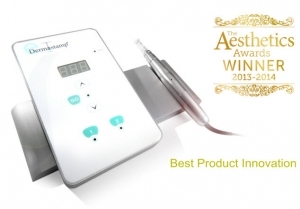 My favourite skin-tightening treatment is the eDermaStamp (eDS for short) and we do a lot here at Advanced Rejuvenation to make it really effective. eDS falls into the category of microneedling. 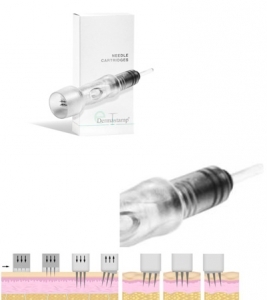 The key thing that you need to know about microneedling treatments is that there is a huge range of quality in the products being used to provide this treatment. We use the genuine device and supplies made with German precision by the German company Dermaroller GmBH. There are lots of imitators made in Asian countries but they are not made with the same quality and attention to detail. The needles are on the tip of a pen-like device that is motorized to make the needles go up and down. As we move the pen over your skin, the eDS is making little punctures in your skin (don’t worry! you’re completely numb before we start!). The punctures turn on all of your healing mechanisms, stimulating your skin to make collagen and new cells. We apply our growth factor serum, TNS Recovery Complex, to your face during the treatment to help you heal faster. At the end of the treatment, we put a collagen mask on your face for 10 – 15 minutes to soothe and calm your skin. Our medical estheticians are highly trained: they must use advanced aseptic techniques to avoid infection, make the treatment pain-free and give you excellent results. We customize the length of the needles for the type of skin we are working on. For instance, for the delicate skin around the eye, the needles are shortened; for thicker skin, the needles are lengthened. We can treat all parts of the face, including around the eyes. To work around the eyes, we have to stay on the bony rim so we pull your skin up at the forehead or down at the cheek to get the skin of the eyelid onto the bony rim. I feel that this treatment is safer around the eyes than doing laser skin tightening. No eye protection is required. Your needles are only used once and then discarded. I have heard of some clinics saving the dermaroller used on you the first time and reusing it on you for your subsequent treatments. As the former Head of Infection Control and the Hamilton Civic Hospitals, I have grave concerns about this practice. I strongly recommend using a new set of needles each time. The picture above shows the single-use needles. It also shows how the needles have a little bit of flexibility side-to-side so that, as the pen moves over the face, the needles slide cleanly out of the skin without any dragging or tearing. 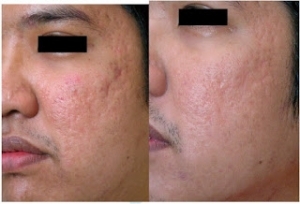 A lesser quality microneedling device can leave your skin looking like a slab of raw beef, bleeding and bruised (eew!). With Dermaroller’s eDS, your skin may look a bit reddened afterwards but otherwise normal. Here is a video showing how the treatment is done: https://www.youtube.com/watch?v=SFsw22MqoSg The model looks quite red during the treatment. The redness calms down a lot while the collagen mask is in place. For the majority of our clients, by the time they exit the treatment room, you can barely see any redness from the treatment. About 3 weeks after the treatment, you will notice fine lines smoothing out, deep lines softening and an overall lift to your face so you have less sagging. Your skin is also smoother, your pores more refined and you have an increase in the overall radiance. 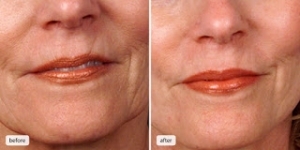 You will continue to make new collagen for about 8 weeks after your treatment. The eDS is excellent for reversing signs of aging. It is also highly effective against scarring. The number of treatments that you need will depend on how advanced your problem is. If you have lost a lot of collagen in your skin, meaning you have a lot of wrinkling and sagging, I may recommend that you do 6 treatments in a year. For the average person in their 40s or 50s with average wrinkling and sagging, 3 treatments is enough for the first year. After the first year of intensive treatments, maintenance will be 1 to 3 treatments per year, depending on what your skin is like.